Woman to Woman: Thanks be to God! It's eleven days until Thanksgiving Day! In last week's post I wrote about developing a lifestyle of gratitude and thanksgiving instead of just focusing on giving thanks only one day of the year. I mentioned how keeping a daily gratitude journal has been life changing for me in that area. But, what about those times when you're really struggling to give thanks, when you're going through a time of testing or trial in your circumstances or in a relationship? It's at those times that you have to choose to have an attitude of gratitude. Then go on a treasure hunt, (of sorts!) Begin to search for the little things to give thanks for, in spite of your area of struggle. For example, "Thank you, God, for that wonderful first cup of hot coffee this morning!" "Thanks God, for the beautiful autumn colors on the tree in our front yard." Next, look for something you see God doing in the middle of your difficult situation or something to thank God for in that person you're currently struggling with. "Thank you, God that we had enough money to pay our rent this month, in spite of our current financial struggles." "Thank you, God, that my husband is such a hard worker and tries his best to provide for us." 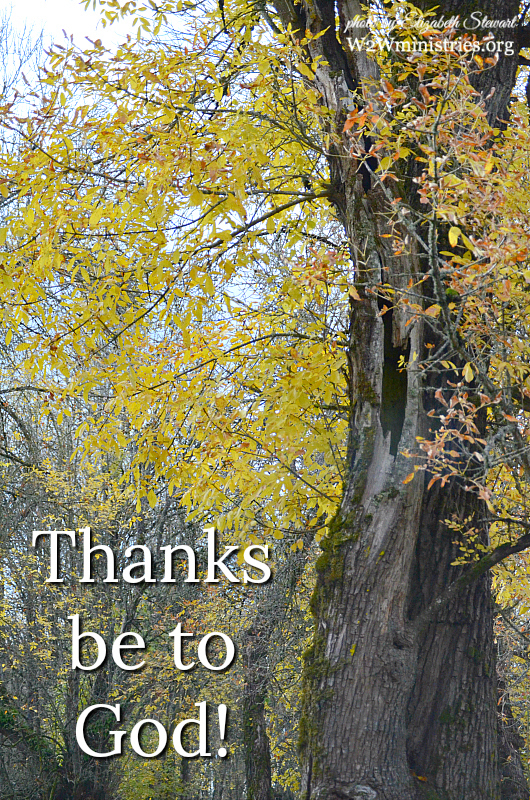 Above all, think of what you can thank God for about Who He is and what He has done for you. "Thank you, God, for Your great love for me!" "Thank you, God, for sending Your Son to die for me." "Thank you, God for your mercy and your grace." Yes, we've all faced times when the last thing we feel like doing is giving thanks. But, the truth is, focusing on the things we do have to give thanks for actually helps us to endure the hard times. There is ALWAYS something to be thankful for. Sometimes, we just need to look a little harder to see it. We have been going through one of those times. Both my husband and I have been sick, he with pneumonia and me with a a sinus infection, we've had car problems with both cars....I could go on. But, we are thankful to be going through these very temporary times together. And, we know they will pass.